The Yellowstone fly fishing season opened yesterday! Opening day typically means dry flies on the Firehole River, but this year nymphs and wet flies were the best. We began our day in the Firehole Canyon with flows around 500 cfs. Flows had dropped from 1000 cfs a few days earlier with cooler weather and some light rain. Word was that the Stonefly nymphs were already on the banks, so we had to see for ourselves. The Stonefly nymphs were there and the trout were looking for them! We fished #4-10 Rubberlegs with varying droppers – #12 Prince nymph, #16 Pheasant Tails and Red Copper Johns. We found several willing trout in the slower moving runs close to the Gibbon confluence. A few Brown trout even ate big foam dry flies in the pocket water closer to the falls. After lunch we moved upstream to look for some more dry fly fishing. We were deterred by the crowds at Fountain Flat. We kept going to the Mallard Creek area and found fewer people. The long runs in this area looked promising for finding trout rising to dry flies, but we only found a few fish looking up. They were willing trout and smashed a #16 Yellow Film Critic on first pass. Yes, I do like dry flies! The water was still a bit high, and as a result nymphs and wet flies were more consistent. Red Copper Johns and Pheasant Tails were really all you needed. Swinging small yellow soft hackles through the riffles was also very productive. All in all, it was a solid day on the Firehole. The flow drop definitely helped the fly fishing. Weather for the next week is forecast to remain in the 50’s, so it looks like flows will remain consistent in the 500-600 cfs range. We will be run guided Yellowstone fishing trips here for at least the next three weeks. Is that a boat ramp? I drove through the Lewis River drainage on my way up to the Firehole and stopped to see how Lewis Lake looked. It looked great, if you were going to ski across it! The parking lot was plowed, but the boat ramp and lake itself were still under a couple feet of snow and ice. What a difference a year makes! On Opening Day in 2016,we motored all the way to the Lewis Channel and caught numerous trout. 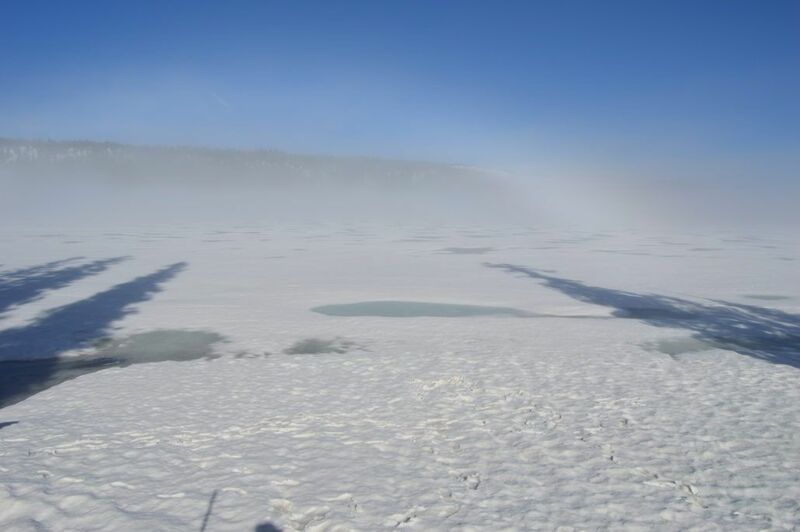 Lewis Lake should thaw out by June 10th, but it all depends on the weather! Call us at 307-690-1139 for the latest Yellowstone fly fishing report and to book your trip! Fly fishing in Yellowstone Park has been pretty fun lately! 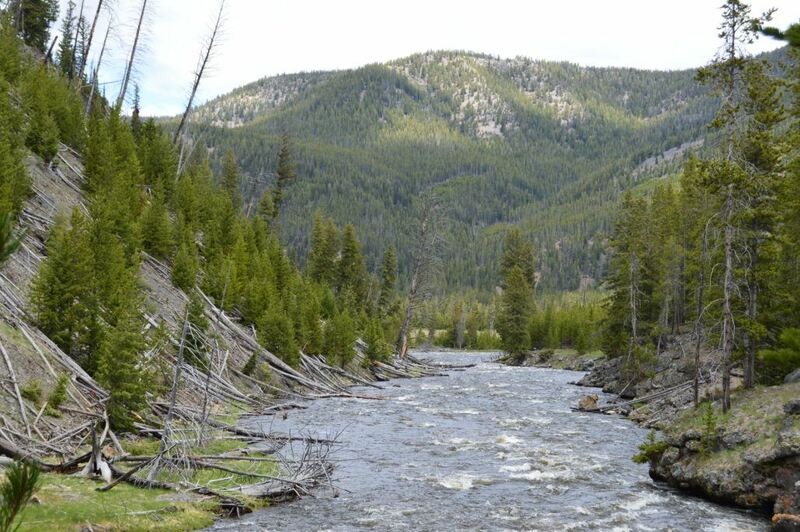 There are a few venues worth visiting at this point – Firehole River – All of this rain has produced great BWO and PMD hatches on the Firehole recently. Good fly fishing begins around 9am with Spinner Falls and lasts into the early afternoon or possibly later if it’s cloudy. Your favorite PMD or BWO cripple pattern with a traditional presentation should produce trout. If it’s warm and sunny, think Caddis. Swinging soft hackles is a fun way to catch trout on these days. 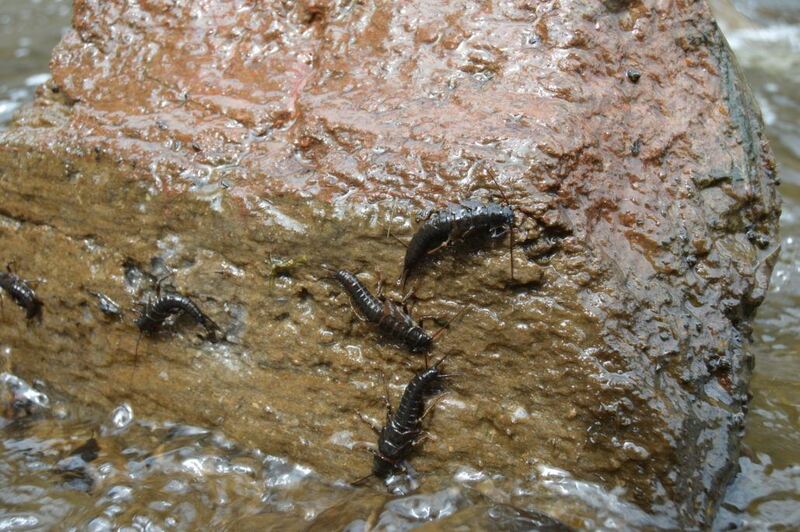 Remember that if you see splashy rises or trout jumping out of the water for something, they are looking for Caddis. Tan X-Caddis are always good here, but don’t forget about White Miller Caddis patterns as well… Madison River – there are Salmonflies flying here! 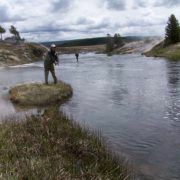 As always, the Madison in Yellowstone can be a fickle fishery, so be prepared to fish the big dries, nymph, or swing soft hackles/streamers. Don’t forget to cover some ground, the determined fisher is rewarded here.. Lewis Lake- this has been a very consistent fishery for us recently with both spin and fly gear. Best fly tactics on the lake consist of sink-tip and full-sink lines with leech patterns and streamers that imitate brown trout fry. 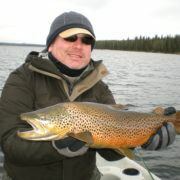 Try ledges/drop-offs, and the inlet and outlet areas for the most consistent fishing for Brown and Lake trout 14″-22″. 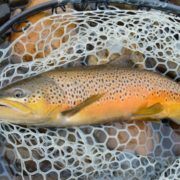 Hatches are starting up here and the Browns are following the bugs to shallower water, making them more visible and bringing the sight-fishing game more into play. Stay tuned for further details. Double from the Firehole River! 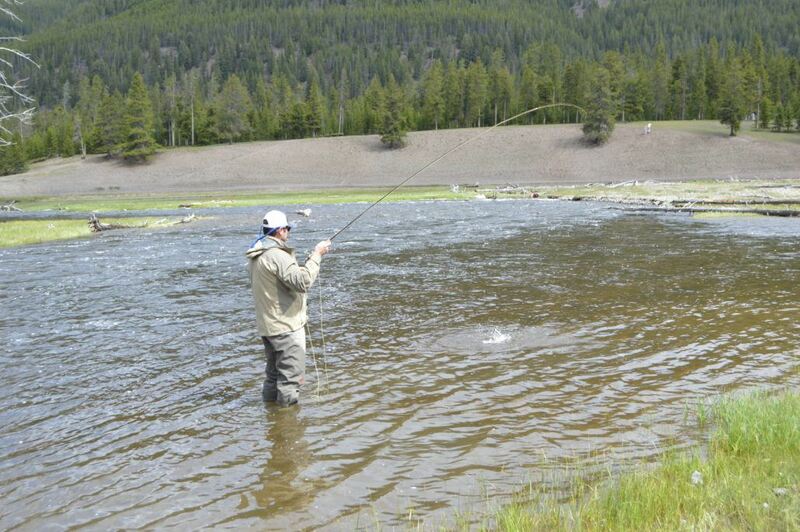 Yellowstone National Park opened to fly fishing a week ago to little fanfare. 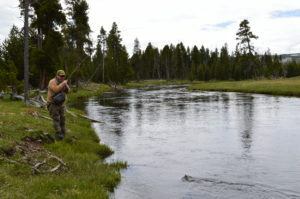 Abnormally high daytime temperatures melted our dense snowpack and the Firehole River rose to record levels in a matter of a few days making fishing very tough. Both Yellowstone and Lewis Lakes still had ice on them leaving us dreaming of days to come… This week will be a different story! Flows are dropping on the Firehole to fishable levels and a few rain showers should spark the Mayfly emergences that this river is known for. Look for PMD’s and BWO’s to pop during inclement weather, especially in the afternoons. The ice is off Yellowstone Lake and there is some decent fishing to be had. It takes a few weeks for the water here to warm up and the trout to move into the shallows. Lewis Lake is just now icing off on the edges and should ice-free by the end of the week. It doesn’t seem to take quite as long for the fishing to get going on Lewis since Brown and Lake trout aren’t afraid of cold water. We’re pumped to be fishing in Yellowstone!! Give us a call at 307-690-1139 to book a trip or check out our Yellowstone fly fishing page on our website.. Fish the Fly is excited to announce that it has received a CUA to operate fishing trips in Yellowstone National Park! 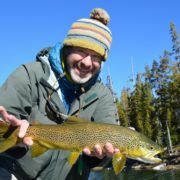 This means that the scope of the trips we will offer in Yellowstone has just grown exponentially from what we were able to do previously through our relationship with Teton Troutfitters. Many thanks to Scott Hocking for this opportunity and we look forward to working with him more in the future. Fish the fly will focus on the southern half of Yellowstone as these fisheries are closest to Jackson Hole. Lewis Lake, Shoshone Lake, the Snake River, Yellowstone Lake, and numerous backcountry streams are all on the radar. We will be expanding our backcountry program to include overnight offerings to lakes and streams, so stay tuned for more information on these gems! 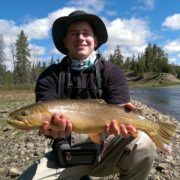 For now check out our website for Yellowstone fishing trips. Snowpack levels are all above 100% of normal currently, so it will be a great year for our trout! 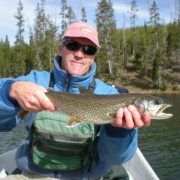 Yellowstone National Park closes for the season this coming Sunday the 3rd, so now is the time to enjoy the superb Fall fishing for run-up Brown trout. There are numerous trout in the Snake, Madison, Gibbon, and Firehole River below the falls. Rainbows in the Madison system and Lake trout in the Snake follow these runs looking to feed off the eggs from these spawning trout. 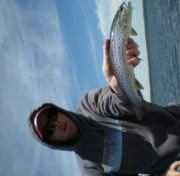 Lewis Lake also holds plenty of fall spawning Mackinaw and they are aggressive to the fly! 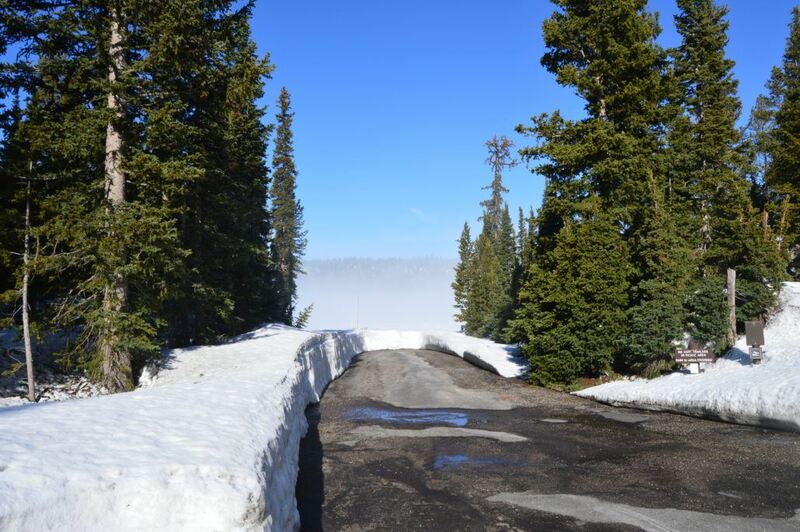 Yellowstone has reopened! The crowds are minimal and the fly fishing is phenomenal…. Looking for a trout of a lifetime? 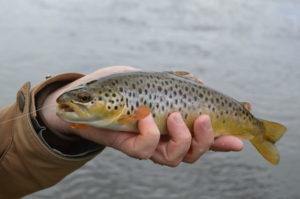 The Fall Brown trout runs are in on the Snake, Lewis, and Madison Rivers. Throwing streamers is the best way to get into these aggressive trout. Olive, Yellow, Black, and Purple are good colors to try; keep switching until you find what they are looking for that day. Pattern size can make a difference as well. Not every trout wants a steak dinner plus all the fixings….